As you know, gentle reader, I’ve always viewed my submission to the C4C grant as a long shot. So while I’ve been wringing my hands for months desperately hoping “Heroes of the Dead” might somehow pull off a win, I wasn’t terribly surprised by the outcome. 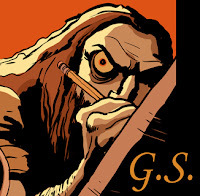 So what does this mean for ol’ Glen Specter, for Heroes of the Dead, and for Specter Comics? Why, it means great things! Terrible, fantastic, horrifying things!! As you might have seen from my little teaser for “Rotting Hills”, I’ve got lots of plans for Specter Comics. I’ve decided to officially make Specter Comics my platform for self-publishing. So along with “Heroes of the Dead”, I’ve been tooling around with another zombie idea geared towards kids called “Rotting Hills”. I mean, can you think of one successful zombie comic for kids? Me neither! So there’s definitely a niche to fill. “Rotting Hills” began life (sorry :P) as a cartoon idea I successfully pitched, produced and directed over a decade ago (god I'm old!). While the animated cartoon died when the production company ultimately passed on the idea, I thought it high time to resurrect Rotting Hills in comic book form! If you’re curious, the cartoon looked like this. My plans for the comic book are a little different, as I have no right to the stories or artwork of the original production, but I’m really excited by some of the ideas I’ve come up for it! Thus, whilst old man Specter had been beaten down and had his old withering heart crushed by the above news, I also feel liberated. For the months I was waiting on news about the grant, I felt trapped in limbo as I didn’t want to proceed with anything until the grant was settled. Now I’m free to go whole hog into self-publishing and see where it leads me. From there I’ll be publishing “Heroes of the Dead” #1 very shortly and see how it does! And the good news is I’ve already finished the scripts for issues #2 and #3, so work on the art will begin forthwith! As for Rotting Hills, I’ve been working away at a script for the first issue. I’ll be posting progress for that project here on Dying to Draw as well so stay tuned!